Wow. 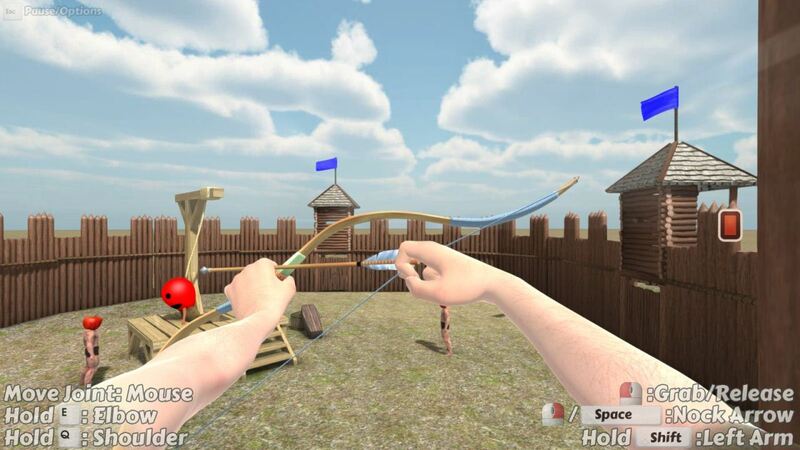 Archery, QWOP style – how’s that for a unique concept? Originally a 7DFPS entry, the developer has since expanded upon it and released an early demo of the improved version. But is it any good in its current state? Well… yes and no. Between Wii Sports Resort, Mount & Blade: Warband and The Elder Scrolls III, I’d consider myself quite adept in terms of video game marksmanship. Based on that, I figured “how hard can Probably Archery be?”; as it turns out, I was not prepared. At all. According to South East Games, their creation is inspired by QWOP and Surgeon Simulator 2013, although with less fractured ribs and far more complex controls. Let’s see if describing this works is going to make your head spin, as it did mine: joints are controlled by moving your mouse. Holding down Q or E determines whether you’ll be moving your elbow or shoulder. Left mouse button grabs an arrow while the right nocks it. Oh and holding down shift lets you do all that… with your left arm. Confused yet? It took me a while to get the hang of it all and even after I did, no targets were hit. Maybe I’ve been spoiled by crosshairs in first person shooters or maybe I was doing something wrong, but man, those targets had nothing to fear from me; until I plugged in my Xbox 360 controller, that is! Whereas the mouse/keyboard setup requires holding down shift to switch between your two arms, with a controller, you’ll be able to move both simultaneously – left stick, left arm; right stick, right arm. Brilliant. The bumpers are then used to cycle between joints. Definitely the better control scheme, in my experience. I did still have some issues wrapping my head around it all, easier controls or not. QWOP had four buttons to manage, Surgeon Simulator 2013 upped the ante by having you control two separate hands at the same time and Probably Archery… phew! 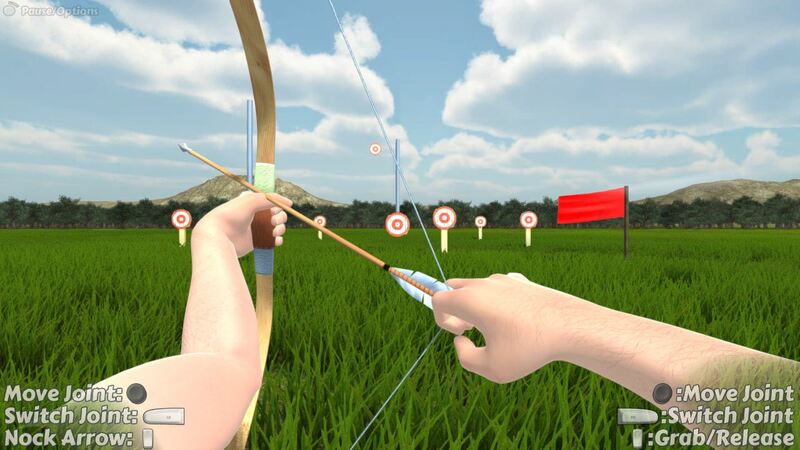 More like, Archery Simulator Pro. After spending a couple hours in the modes available, from basic Target Practice to the far more advanced – and time limited – The Noose, I started wondering if the controls weren’t making the game more difficult than it needs be. After twisting and flailing about for a good bit, trying to get into a position from which I could properly line up my shot, I realized what might be part of the reason for my frustration: if you move your joints around too much, it can be quite tricky (and time consuming) to adjust your aim once the arrow’s nocked. Remember, unless you steady the bow first, chances are your arrow will end up on the other side of the mountain instead of on your target… if that makes any sense. Hope it does, because I’m not sure how else to explain it. With control of the shoulder, elbow and wrist joints of your left and right arms, you must overcome a series of ridiculous challenges ranging from shooting a hangman’s rope to stopping an apple-headed warrior in space. Keep in mind that the build I played is not a representation of the finished product, and since the Greenlight page lists “early 2014” as the release date, there’s still time to polish Probably Archery. That said, the demo is a noticeable improvement on the 7DFPS entry, and it can be quite entertaining in spite of aforementioned issues. So go ahead and let loose an arrow or two in the demo! Worst case scenario, you’ll fail miserably and have a good laugh as it flies off to God knows where.